OTTAWA - The Liberal government gave $35 million to a chemical company that makes plastic resins just one day before Prime Minister Justin Trudeau promised to use Canada's G7 presidency to get other nations to commit to reducing or phasing out single-use plastics. The grant to Nova Chemicals was announced in late January as part of the Strategic Innovation Fund, a $1.26-billion, five-year business growth measure that was unveiled in last year's federal budget. 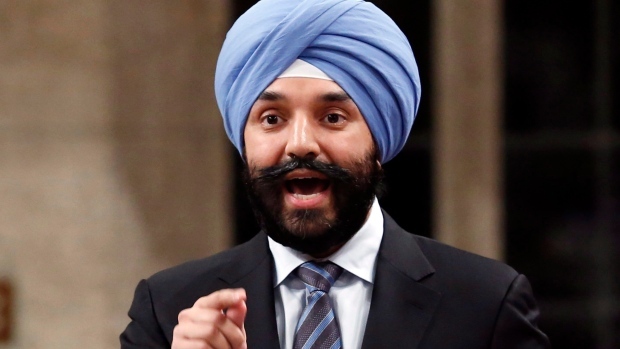 The investment is meant to encourage research and development and "secure a long-term commitment to the company's Joffre, Alta., research and development centre," said Karl Sasseville, a spokesman for Innovation Minister Navdeep Bains. "More specifically, Nova Chemicals is using innovative technologies to produce cleaner resources and less undesirable byproducts stemming from production," Sasseville wrote in an email. "This could mean making products like plastic food packaging stronger and more easily recyclable. This innovation could also be used in products and applications such as small appliances, automobiles, solvents and food and cosmetic additives." According to a Jan. 23 news release from the Chemistry Industry Association of Canada, the money is also going towards Nova Chemicals' $2.2-billion expansion plan in Sarnia, Ont., including a new polyethylene facility and expansion of an existing ethylene facility. Ethylene is one of the main substances in polyethylene; the expanded plant will allow Nova Chemicals to produce 431,000 additional tonnes of polyethylene a year. Nova Chemicals did not respond to requests for comment Wednesday. Polyethylene is the world's most common plastic material. It is largely used to make plastic bags, food wrap and containers such as water and soda bottles, as well as plastic pails, pipes and bins. An estimated 8 million tonnes of plastic garbage ends up in the world's oceans each year, with single-use plastic food containers among the biggest culprits. A day after the grant was made public, Trudeau hosted a roundtable at the World Economic Forum in Davos, Switzerland, with the heads of multinationals and several international environment activists and academics. There, he promised Canada would use its year as president of the G7 nations to get the world to address the issue of plastic pollution in the oceans. "The other big issue we would very much like to highlight and get the global community to show more leadership on is oceans protection, particularly around plastics and pollution," Trudeau said at the start of that meeting. Later that same day, Environment Minister Catherine McKenna said Canada was looking at getting the other members of the G7 to sign a plastics pledge to commit to reducing the amount of plastic that ends up in the ocean. Plastic is often found in the stomachs of marine life; turtles and fish can mistake it for food. McKenna has tweeted repeatedly about the issue in recent days, linking to a Jan. 26 article about the impact of plastic garbage on ocean reefs. Just last week, she responded to a discussion about plastic-lined coffee cups by saying, "Eliminating single use plastics is critical!" Keith Stewart, senior energy strategist for Greenpeace Canada, said it's hard to believe Canada's commitment to reducing ocean plastics when it's providing multimillion-dollar grants to the companies that make them. "So limiting single-use plastics gets tweets and producing more of them gets $35 million," said Stewart. "We really should be trying to ban the use of disposable plastics and find better alternatives." Greenpeace has a number of campaigns to convince people to reduce or eliminate their use of single-use plastics such as polypropylene drinking straws and disposable water bottles. Britain's royal family gave the idea a boost this week when Buckingham Palace announced a ban on plastic straws, bottles and non-biodegradable containers at all royal estates, including public cafes at royal residences and staff dining rooms. "You know you're getting somewhere when the Queen is on side," said Stewart. Canada has no current plans for a ban or limits on the use of plastic in federal government buildings or official residences, said a spokesman for Treasury Board President Scott Brison, who oversees a government strategy to focus on recycling and composting.